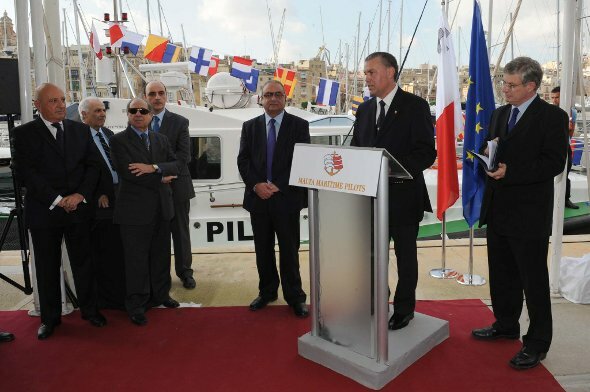 The Malta Maritime Pilots Co-operative inaugurated a new state-of-the art pilot boat named Foxtrot. This €800,000 investment will enhance the pilotage services offered in the Maltese ports. Chief Pilot Capt. Jesmond Mifsud said that due to the ever increasing demands and competitiveness of the cruise liner industry, the pilots took the initiative to invest in this pilot boat immediately and not in four years time as was originally planned. This means that there is now one new pilot boat in each port. Foxtrot, an Interceptor 48 Pilot pilot boat, was manufactured by the Irish Company Safehaven Marine, and is the largest and most powerful pilot boat to grace our ports. Owing to its capability to operate in rough weather, as well as to its speed and size, the Malta Maritime Pilots Co-operative is looking into the possibility of providing this pilot boat as a marine ambulance for local maritime emergencies. The co-operative now has a fleet of six pilot boats available for the service of the Maltese ports. To maintain and crew this fleet the Malta Maritime Pilots Cooperative employs 19 crewmembers, a fleet superintendent, a manager and three extra personnel. Since the management of the pilot boats passed on to the hands of the co-operative four years ago, there never was one delay to shipping due the pilot boats. Prior to the pilot boat reform a delay to shipping due to the pilot boats was something regular. The co-operative recently employed a Master Mariner and three assisting persons to run the pilots training centre. Next week, the Malta Maritime Pilots Co-operative, in conjunction with Transport Malta, Tug Malta and CMA we will be carrying out a simulator study on a 400 meter containership which is expected to visit Malta Freeport in the near future. Training is of paramount importance for the cooperative – the safety in our ports can only be achieved by training and investing in adequate equipment and qualifications. The inauguration of Foxtrot was held at the Malta Maritime Museum in Birgu so as to enable those present to compare the new pilot boat with an old historic pilot boat that will be restored. The Malta Maritime Pilots Co-operative has offered €3,000 to finance the restoration of the old pilot boat. The vast improvement from the old historic boat to the new pilot boat is easy to see. What is not so easy to comprehend is that many of today’s pilots remember the old historic pilot boat used in the pilotage service.